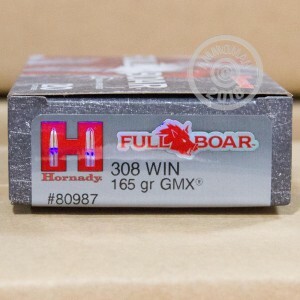 This .308 Winchester ammunition from Hornady is designed for hunting the biggest and baddest of boars! 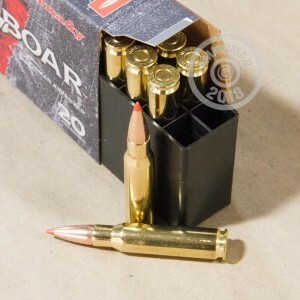 Each cartridge in this box of 20 fires a 165 grain GMX Polymer Tipped bullet at a muzzle velocity of about 2,610 feet per second, delivering superb long-range accuracy for clean kills against wary animals. This ammo uses non-corrosive Boxer primers and brass cases and is loaded at Hornady's historic headquarters in Grand Island, Nebraska. Place an order at AmmoMan.com for $99 or more to qualify for free shipping. If you don't need that much hunting ammo, try picking up some range loads for sighting-in or target practice, or defensive rounds for your carry pistol.